In my last post, I took a look at how Electro’s megalomania completely ruined his golden opportunity to take Daredevil out for good. This time around, we’ll be looking at a situation not quite as ridiculous but very funny nonetheless. In Daredevil #4 by Stan Lee, with pencils by Joe Orlando, our favorite guy in red (eh, make that yellow) comes face to face with the Purple Man, a villain with great powers of persuasion who can rob a bank just by asking the teller to hand over the cash. Daredevil is better able than most other people to resist his powers due to being blind, but he still ends up in a bit of a tight spot in the scene below. We have a mind-controlled Karen one step away from a fatal fall and Matt being held at gunpoint. Purple Man has a perfectly legitimate reason for wanting Daredevil dead: “I cannot allow anyone to live who can resist my power!” Right, so what are you waiting for? I’m going to with narcissism spiked with nostalgia on this one. In fact, the guy might just need someone to talk to. In order to distract his captor, Daredevil asks him to tell him how he came to be the Purple Man. 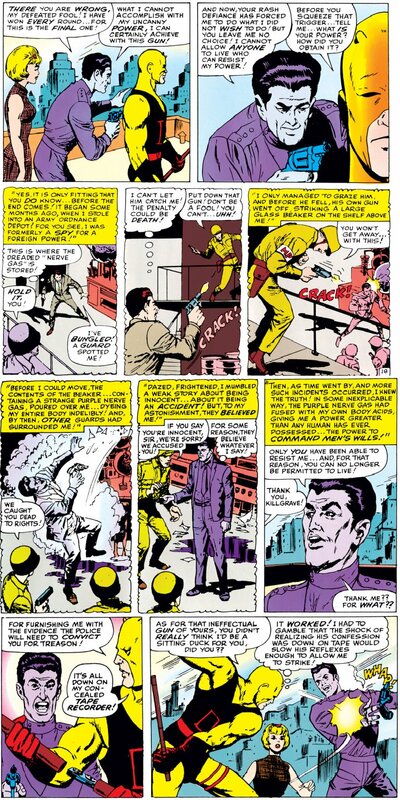 Delighted at the chance to talk about his origin, Purple Man launches into the story of his unfortunate chemical accident and the powers it gave him. Because this was back in the day when Daredevil’s billy club was equipped with every kind of gadget that shouldn’t logically be inserted into a bludgeoning tool, our hero manages to get the whole thing on tape. The shock of noticing the tape rattles the Purple Man enough to allow Daredevil to get the upper hand. Just as he knew it would, of course. Update: This example is probably a misunderstanding on my part. But, I’m leaving it up anyway. Okay, I admit it. This one is sort of minor. "It's all down on my concealed tape recorder" nyah nyah nyah. I cannot wait for the part that will have protagonist the Plastoid, AKA Mr "now-I'll-just-have-to-apply-more-pressure". I can't even fathom the kind of Herculean (almost Sisyphean) effort that you are going to go through to record and explain all of these incidences. It's still a very interesting project though, and if anyone can do it, it's you!